Why do we only eat pancakes once a year? They are so yummy and easy to make that we really should eat them much more often. I think we get a bit scared about making them in case we end up with a big soggy mess, or we flip them so high they stick to the ceiling (I’m looking at you Daddy Pig :)). 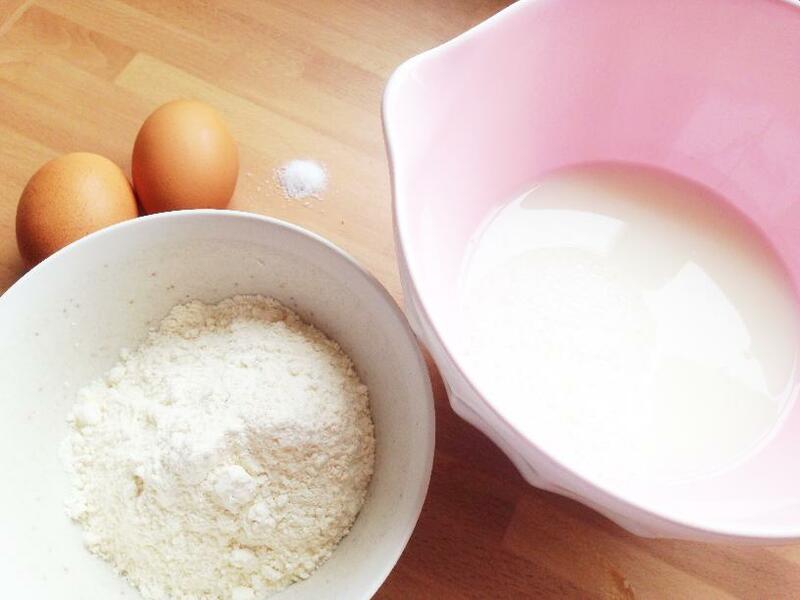 But if you follow our top tips this Shrove Tuesday, your pancakes will be perfect. If you prefer the fluffy American-style pancakes, then you can click here for a great recipe, but this post is just looking at the traditional British type. If you have a large jug then use that for the mixing, as it makes it easier to pour out the batter when it comes to cooking your pancakes. Otherwise, use a bowl for the mixing and a ladle to put the batter into the pan when you’re ready. Start with the milk and then put in all the other ingredients. 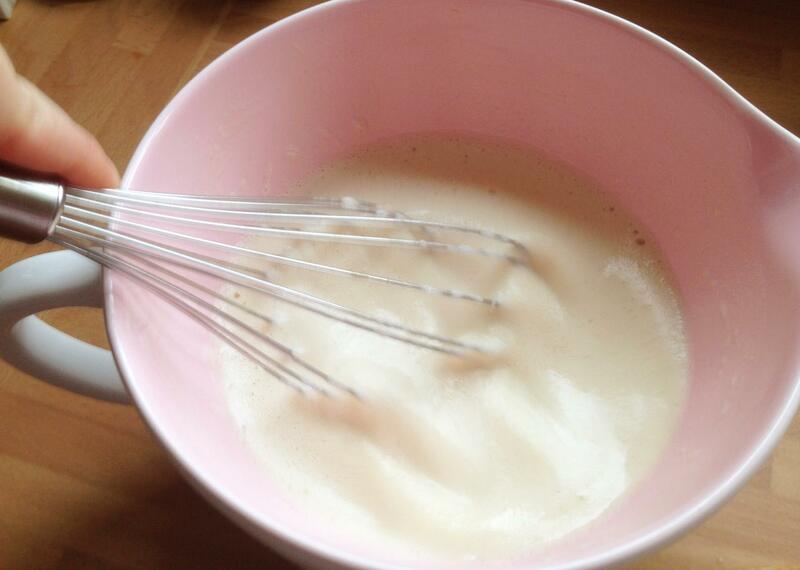 Use a whisk and mix up until you have no lumps left. This seems boring and unnecessary when you just want your pancakes NOW, but resting the batter will help to make your pancakes so much better and less rubbery. 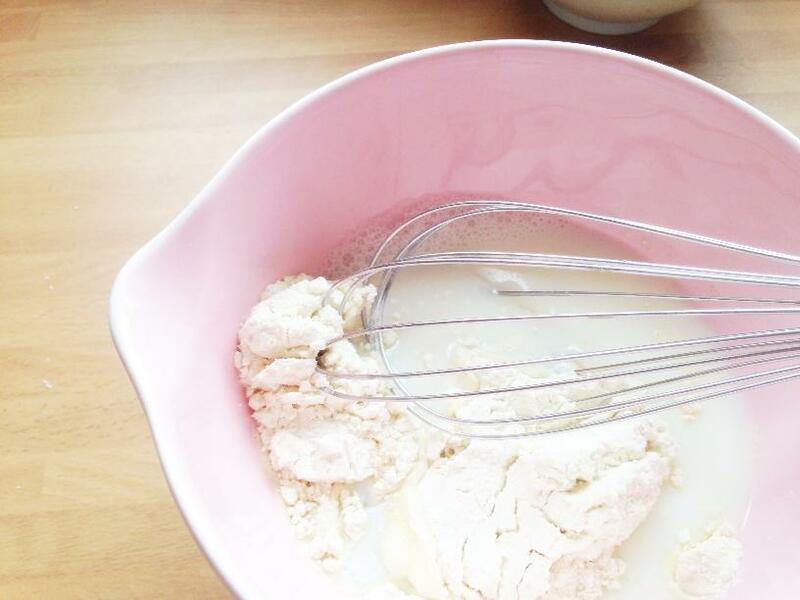 Once your batter is mixed, put it into the fridge until you need it. This can be 30 minutes or you can make it the day before. Here’s the science bit… The starch in the flour absorbs more of the liquid in the batter, so it makes sure the batter spreads more evenly in the pan. The gluten from the flour in our batter also has a chance to relax, so the texture of ours pancakes is more delicate, thin, and not chewy. I’m not going to tell you that you must have a perfect crepe pan to make your pancakes, as, let’s face it, it just won’t get used that much. What you do need to use though is a small frying pan. It’s no use using the big frying pan you use for everything else, as it will make getting the batter to spread evenly so much more difficult. And as for flipping them, it just isn’t going to happen if you use a big pan. 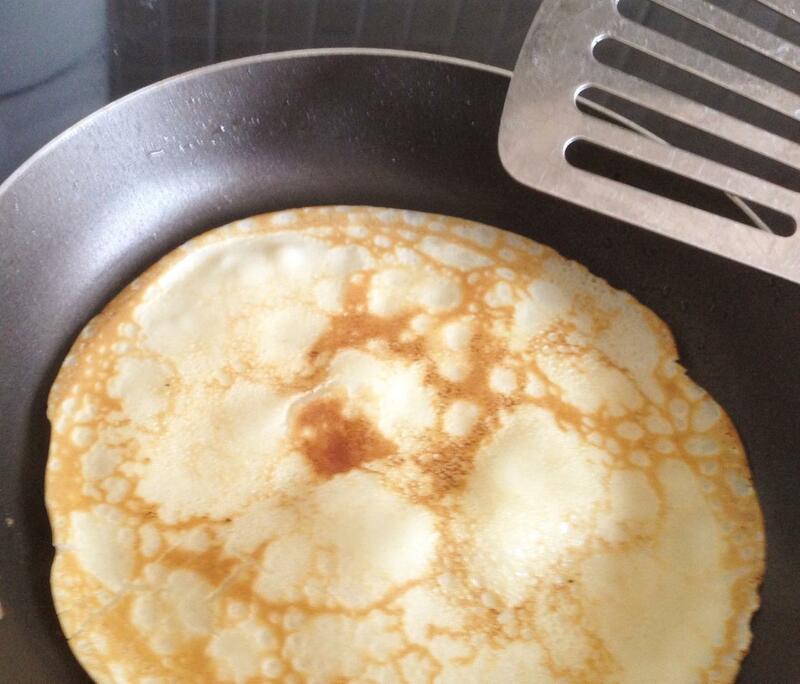 By the way, on the subject of flipping, I just use a spatula or fish slice to turn my pancakes over. Cooking pancakes on too low a heat for too long can make your pancakes rubbery and chewy. The pan needs to be hot, with just a small amount of oil (I use 2-3 sprays of oil–not much at all). 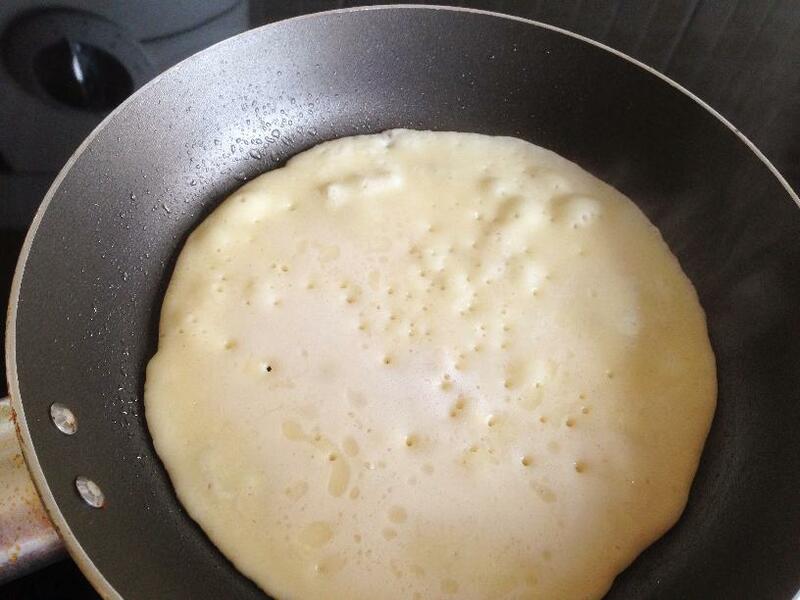 Your pancake is ready to flip when you start to see air pockets change the flat look of your pancake. You may see a golden colour around the outside too. When you flip it over to the other side, you don’t need to cook it for as long–maybe just 30 seconds depending on the heat. The first side of your pancake should look golden with a lacy-type pattern, and reverse side will be paler with random brown spots. 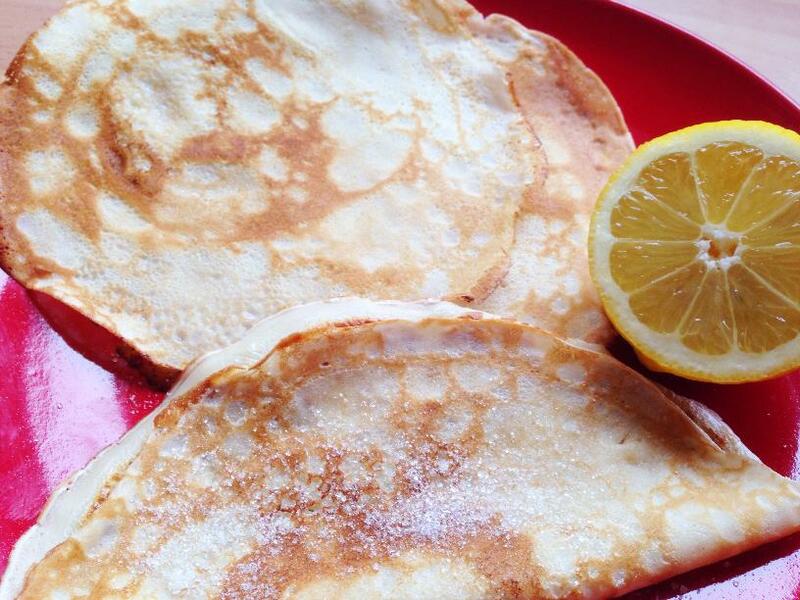 You may think that sugar and lemon juice is the only topping you need on your pancakes, and although it is very yummy, there’s plenty of room to try out some different toppings too. 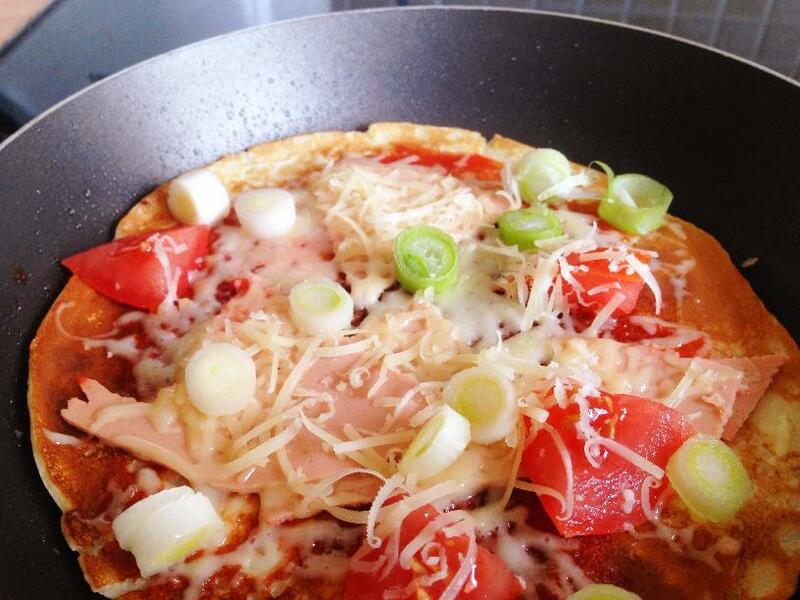 Savoury – For something completely different, why not try a savoury pancake. This pancake pizza is sure to be a winner this Shrove Tuesday and many more days to come. Once you’ve flipped your pancake once, take the pan off the heat, spread with 2 tsp of tomato pasatta (or ketchup), toppings of your choice (we used ham, tomato, and spring onion), and then a handful of cheese. Pop it back on the heat until you notice some of the cheese start to melt. The rest of the cheese will continue to melt once it’s taken off the heat. Yummy and simple! Banoffee – Obviously, we are big fans of banofee pie here at Mini Yummers, but a banoffee pancake is much easier to make. Slice a banana and lay the slices over half of the pancake, squirt or spoon some cream over the top, and then use some toffee sauce to drizzle over the top. 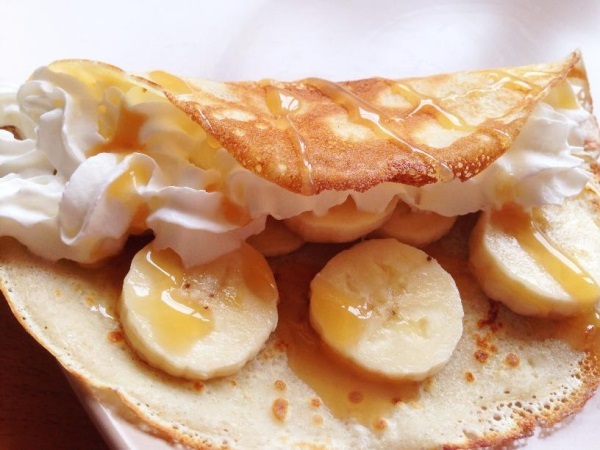 Fold the pancake over and enjoy your banoffee treat. Fruit and Chocolate – Use whatever fruit and whatever chocolate you have in the fridge, cupboard, or freezer. Good combinations are raspberry and white chocolate, pear and dark chocolate, cherry and milk chocolate, but why not make up your own concoction? It’s easy to make, all you need is a handful of fruit, and then spoon some melted chocolate over the top–delicious. Pancake Day happens 47 days before Easter Sunday. Pancake Day is also called Shrove Tuesday (Fat Tuesday, or Mardi Gras in some countries). Pancake Day is the last day before Lent. Lent is where Christians give things up, and Pancake Day is a time where they can have one last treat before Lent begins. Traditionally, things like eggs and butter/oil were forbidden during Lent, so people made pancakes to use up these ingredients. Some great advice – thanks for sharing. I love the savoury pancake idea – going to try that on Tuesday. So pleased to have found you on the #TheList. I work to promote cooking with children aged 1-4 for all the same reasons you talk about. Looking forward to checking out your recipe ideas and sharing some on @cookwithtots and http://www.facebook.com/cookwithtoddlers. Brilliant site. Hi Annabel! How wonderful to meet you 🙂 Now I have another reason to love #TheList. Mini Yummers is aimed at primary school-aged kids so I have a feeling we’ll complement each other perfectly. Oh my, your pancakes look lovely. I use margarine instead of oil because I like that almost burnt butter taste but the rest of your tips I use. Enjoy your cakes on Tuesday. I might try that Banoffee, because, YUM. It’s like the holy grail isn’t it? Finding the perfect recipe, definitely going to give this a go! Flippin’ heck those pancakes look amazing!! I always shy away from ‘normal’ pancakes (I always use oats) as I thought the ingredients was too complex – you just use 4, so I may well try these!! I am cooking pancake for breakfast today! You recipes never failed me. I even suggested it to my friends back home. ?